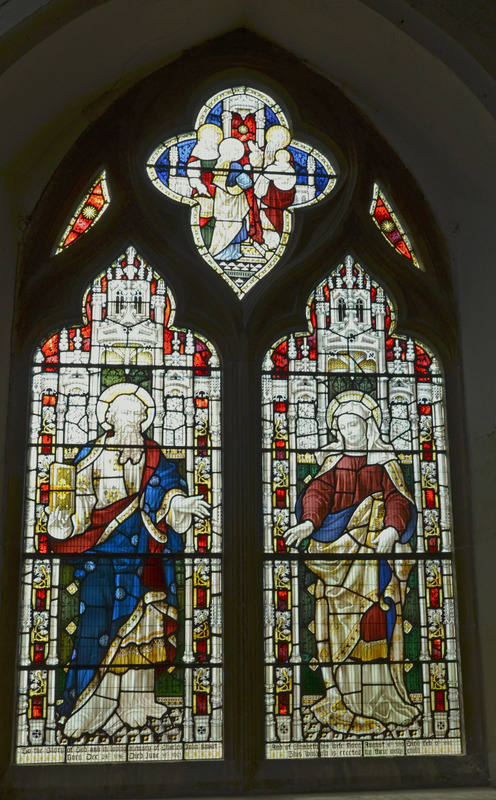 There are eighteen windows in the church of various sizes and architectural styles; ten are glazed with plain glass, the rest (facing east and south) contain designs in coloured glass most of which date from the Victorian period. No medieval glass survives and it is highly unlikely that any original stonework can be found either. The newest window and the first new stained glass window for over 60 years is in the Chancel. 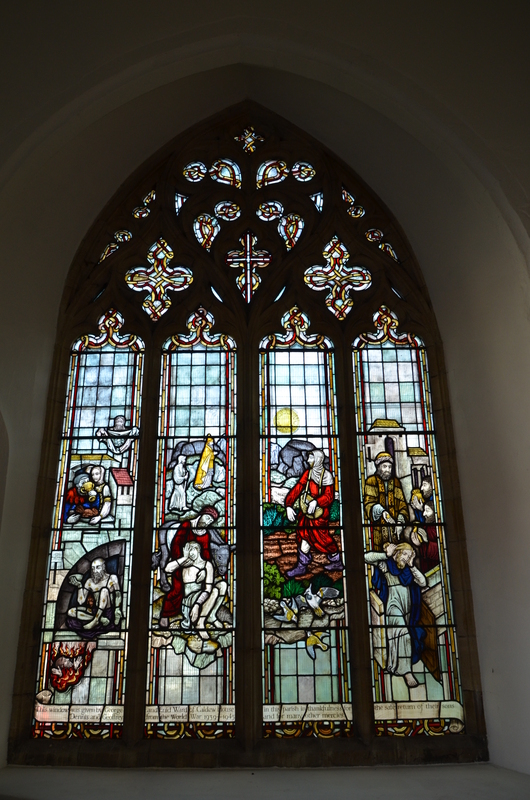 The window was installed at St Margaret’s in October 2014 in memory of Captain Daniel Read from Rainham who was killed in Afghanistan whilst trying to defuse an improvised device. Daniel was born in Kent and attended the local school, He was 31 years old when he died. The window was designed and installed by Shelly Kitto from Rochester and is the first new window in this Grade I listed building since 1946. The window depicts the ammunitions technical officer emblem to represent his role in the Army, the badge of 11 EOD Regiment, in which he was serving when he died, and “ubique”, the motto of the Royal Engineers, in which he served when he joined the Armed Forces. It also includes a dove as a symbol of peace, Remembrance poppies and mountains to represent his love of climbing. Capt. Read’s family, his former school, Rainham Mark Grammar, Southern Water, family friends and complete strangers all helped raise the money for the window. The window was blessed by Revd. Judy Henning at the family Communion Service on 2nd November 2014. In 1897 a faculty was granted to the Rev. 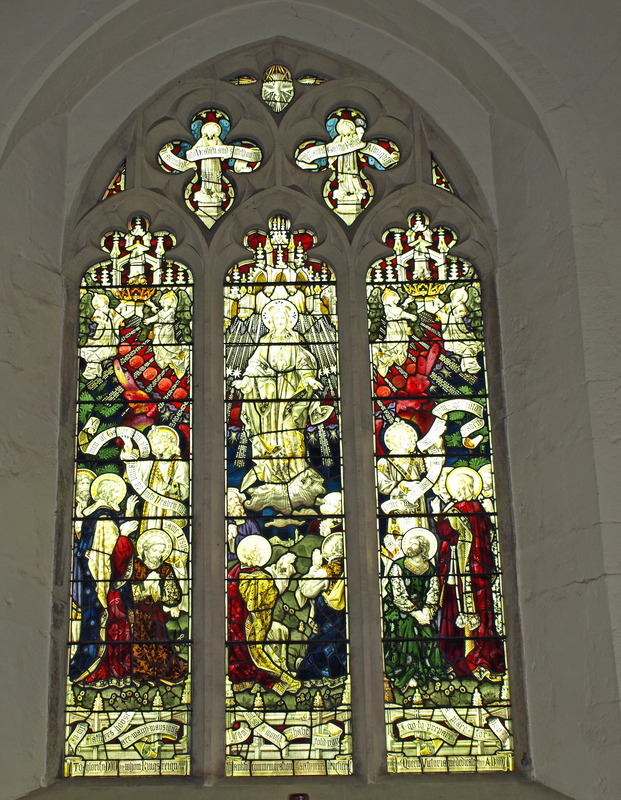 Charles Cobb, Vicar, and Messrs. S.J.Brice and J.A.Walter, Churchwardens, to erect a stained glass window at the east end of the chancel to commemorate the Diamond Jubilee of Queen Victoria (1837-1901).This is the window we see today and in it a representation of the Ascension of Christ. In the quatrefoils at the top are the words ‘He ascended into heaven and sitteth at the right hand of God the Father Almighty’ Lower down we read ‘Ye men of Galilee why stand gazing into heaven: this same Jesus shall so come in like manner as ye have seen Him go into heaven’ and at the bottom ‘In my Father’s house are many mansions: if it were not so I would have told you I go to prepare a place for you’ Under this is the caption ‘To glorify him by whom Kings reign and in thankful commemoration of the sixty years beneficent rule of Queen Victoria we dedicate this AD 1897’ It was made by Messrs. Ward and Hughes, stained glass painters and cost £153-0s-6d. the money coming from public donations. The tracery in this window is early Perpendicular in style dating from the 15th.C. and was completely renewed, using Savonnieres stone, in 1983.A small plaque on the wall just to the right of the window has this inscription ‘This window was restored in loving memory of Jack Clark 1910-1980 by his wife Pauline. The oldest visible part of the present building is the south wall arcading of the 13th.C. chancel which is built in the Early English style. Originally a lancet (a slender pointed-arched window) would have been set within each of the four chamfered arches, but only one remains. Along the south wall of the nave we see three windows all commemorating people associated with Rainham in the past. The smallest (that nearest to the pulpit) is a stained glass window with this inscription ‘To the Glory of God and to the honoured memory of John Mainwaring Tamplin Vicar of Rainham 1908-1922’(3) It was made by Messrs. Ward and Hughes Stained Glass Painters of London and dedicated by the Rural Dean of Sittingbourne, the Rev.A.P.McNeile on 19th. August 1923. In addition to the ‘Tamplin’ memorial window in the south wall of the nave there are two other stained glass windows, with identical tracery, one each side of the South Door. 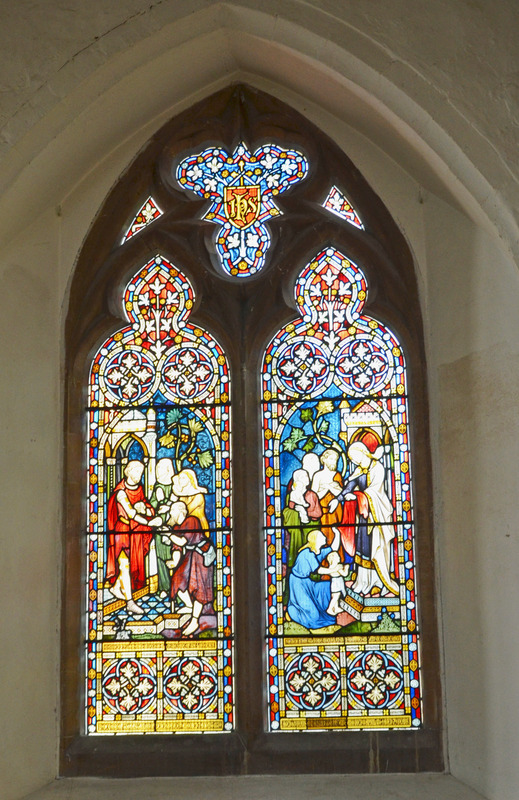 At the bottom of the left hand light of this window are the words ‘Feed my Lambs’ and in the other ‘Feed my Sheep’ In the quatrefoil at the top are the words ‘O all ye Fowls of the Air Bless ye the Lord, Praise Him and Magnify Him for Ever’ In an earlier guide to the Church it says The rural scenes and game birds of the Brice window commemorate a parishioner whose favourite sport was shooting’. there is a variety of architectural styles to be seen in the four windows of this part of the building. All are fitted with plain glass. Two have identical tracery of the decorated period of Gothic architecture. In the north wall one can see how one of the three original window openings was altered to accommodate the insertion of a late Perpendicular one. The top of the earlier arch was left in situ and was discovered in the restoration of the 1920’s. All are glazed with plain glass. The glass, which was designed by Francis Spear, was not fitted until 1953 and unfortunately almost obscured by the organ. It was not until the organ works were moved to the back of the church a year or two later that the window could be seen to full advantage. In each of the four lights there is depicted one of the parables told by Jesus, namely; the rich man and Lazarus the poor man, the Good Samaritan, the Sower and the Talents. 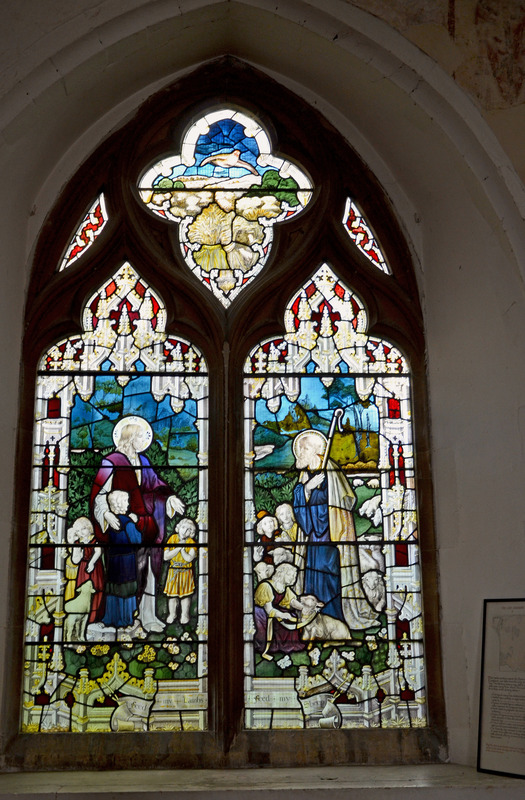 The caption at the foot of the window reads ‘This window was given by George and Enid Ward of Caldew House in this parish in thankfulness for the safe return of their sons Denis and Geoffrey from the World War 1939-1945 and for many other mercies’. At the turn of the eighteenth-nineteenth century Thomas Fisher, F.S.A. visited many churches and made drawings of what he saw. His subjects included brasses and painted glass. Among his collection is a drawing of one of the quatrefoils in the tracery of the east window of St.Margaret’s Church showing an heraldic shield bearing the arms of Robert de Crevequer the founder of Leeds Priory to which he gave the advowson of this church. It is held by an angel (whose head is missing) in white and stain. The background of the light is blue. This shield is also recorded in ‘A Book of Church Notes’ by John Philipot, Somerset Herald, compiled in the early part of the seventeenth century. 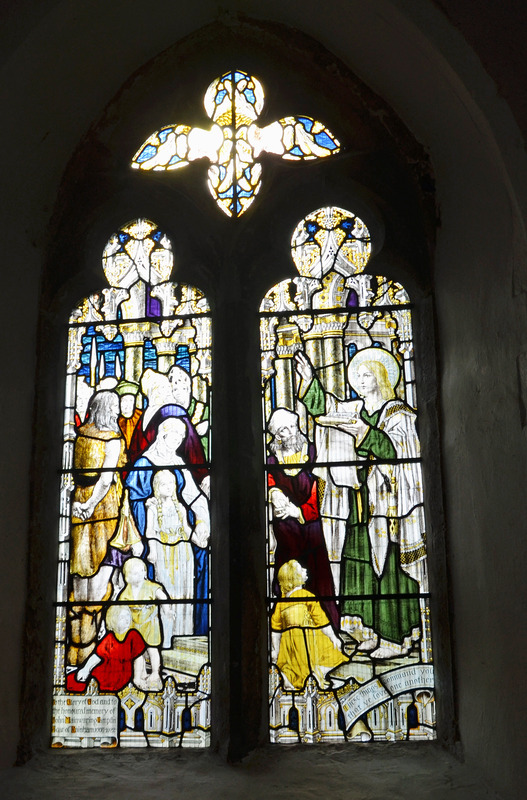 Among other shields he saw in the windows ‘In Raineham Church by Newington’ were those of Donet. (The Donet family were of Sileham, in this parish, and the last of them in the male line, James, died in 1409, leaving a daughter and heir, Margery, married to John St. Leger of Ulcombe), and one which was probably the arms of the Augustinian Priory of Cumbwell, in Goudhurst. Most of the text above is from The History of Rainham and the Church articles published in “Sunburst” during the period 2001-2008 and written by Eric Cross.